One of the things I have always enjoyed reviewing for GamingNexus are home theater or gaming specific projectors that bring your gaming to life on the big screen. 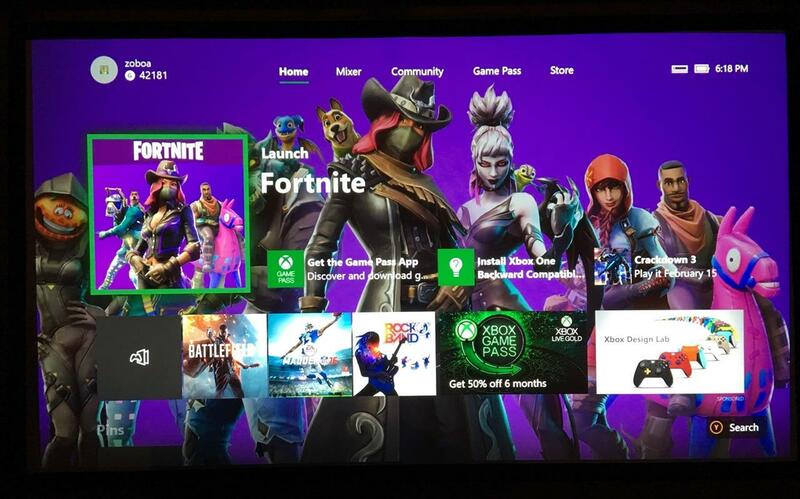 There really isn't anything like it, as the difference between a 65” flat panel and a 92” screen may not seem like much, but they are simply world apart when immersing yourself in the games. With the ViewSonic PX706HD, I think I may have finally found that perfect projector that blends everything you would want (quality, picture, look, ease of use and price) into a single box that is a must have for your gaming experience. The PX706HD came packaged within a foam protector, and wrapped in a foam sleeve within the retail box, which should completely protect the unit from any puncture or shock damage while in the logistics of transit. 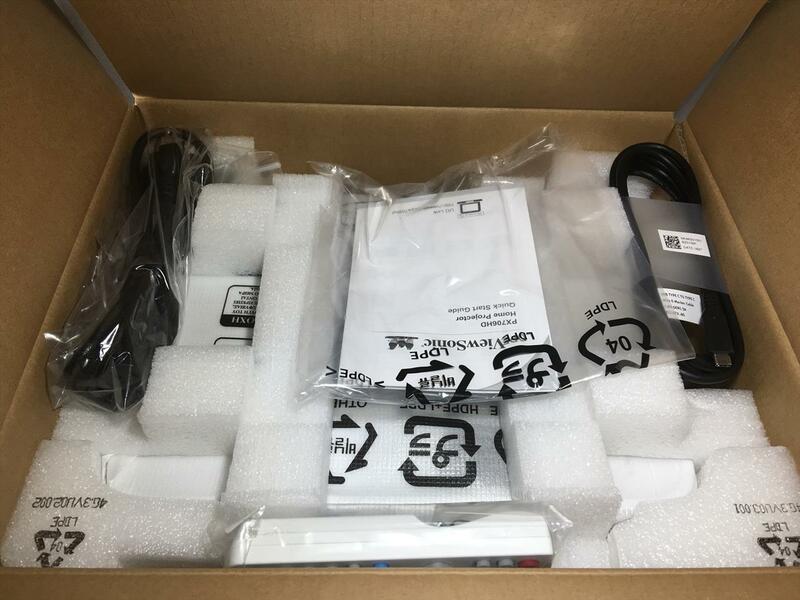 Also included were a standard AC Power Cord, USB-C Cable, Quick Start Guide and Remote with two AAA batteries, all in their own plastic wrap. Aesthetically, the projector is quite pleasing, coming in a matte white finish, with a more vertical box form factor. 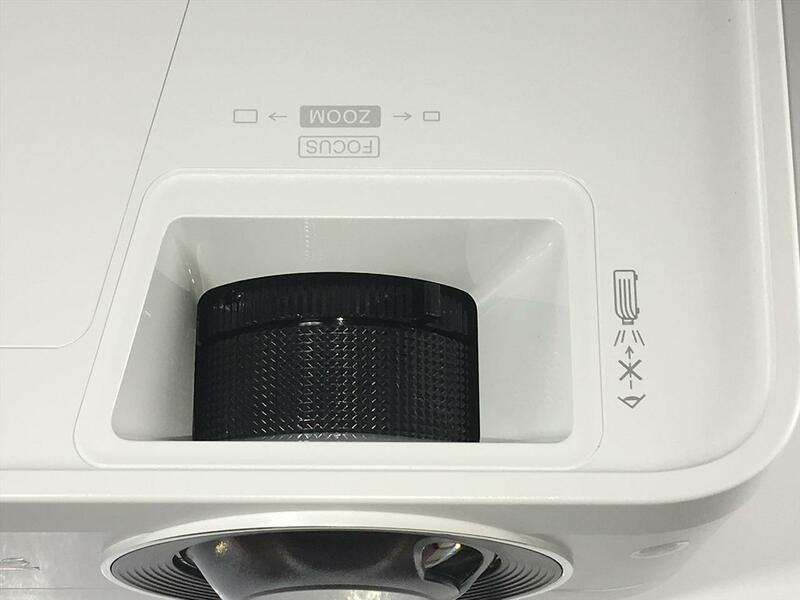 The finish is important, as many projectors ship with high-gloss, and while it has a great look, it easily retains fingerprints and smudges and isn't very logical for a smaller projector that may be moved around instead of permanently mounted to a ceiling. The front has the lens and IR remote sensor to the right and part of the vent for the lamp heat wrapping around from the left side. The sides contain more heat vents and the bottom the adjuster foot, rubber feet, ceiling mount holes and security bar for anti-theft lock slot. The back panel contains two HDMI, Audio in and out, USB-C, PC RGB, RS-232 control, Mini USB and analog video ports. The top contains the command center controls and lens adjustment rings (See below). Overall, the PX706HD is laid out much as I expected, with smart decisions on locations of the ports on the back panel and a good amount of controls on the command center. 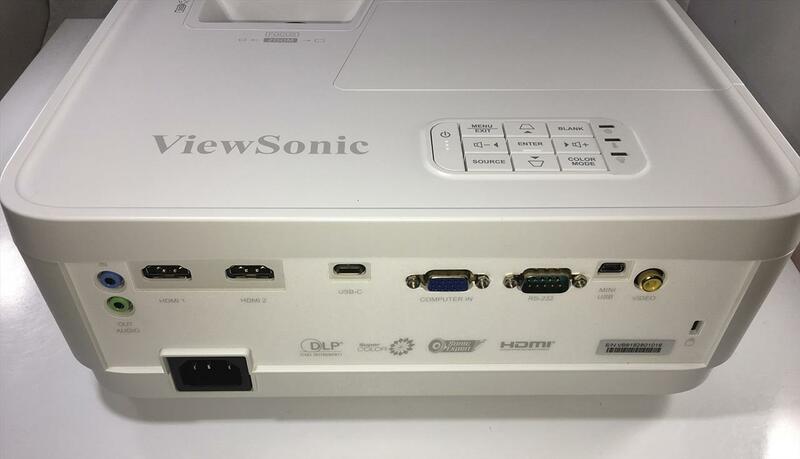 Much like the look, the functionality and placement are all logical and what I would expect from ViewSonic who have a reputation of providing attention to detail to make their products consumer friendly. Hooking up the PX706HD was super easy, as I was out of the box and starting to play the Xbox in about five minutes. Granted, this went into a temp placement in my testing area, but it was about as simple as plugging in the power, HDMI and getting the distance and alignment in place to match my 92” screen. With the unit being a short throw projector, and my Da-lite screen being 92”, I went with a tabletop mount at a throw distance of 5’3: to fill the screen screen completely. 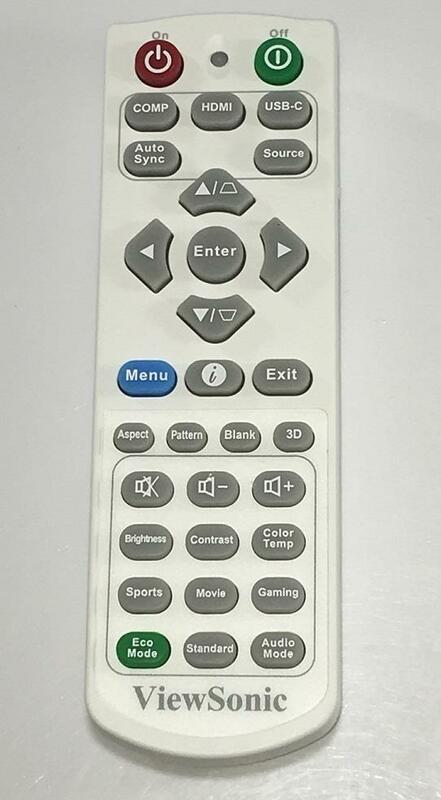 ViewSonic put all the controls necessary on the remote or the unit itself, and doesn't bury things three or four menus deep like some other companies. 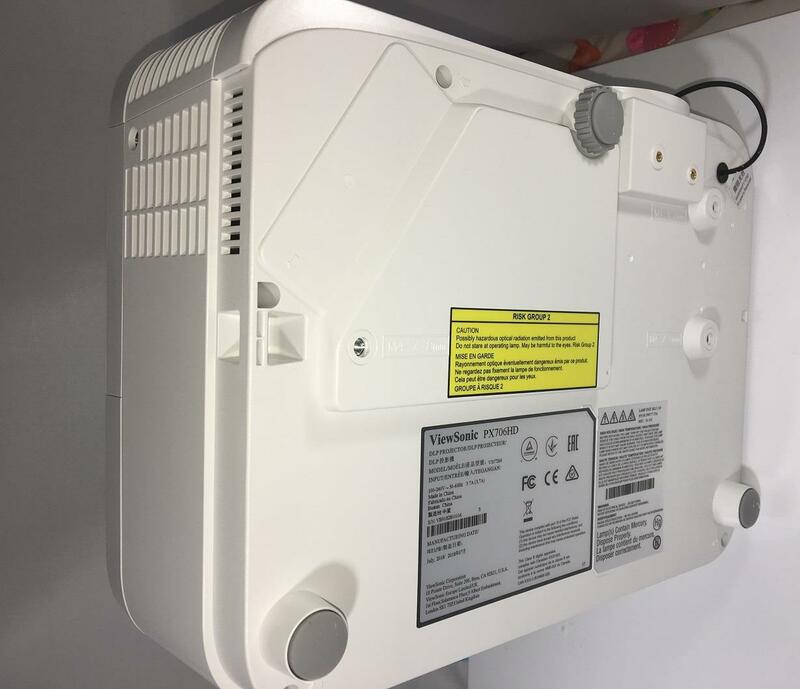 While the user guide may be lengthy, is is very detailed and extremely helpful to give you step-by-step instructions on getting the most out of your projector. Basically, this is a very easy projector to set up and optimize, even if you have never installed one before. The command center on the projector chassis is also loaded with buttons (which is a good thing), so you are not reliant solely on a remote that could get lost or broken. In addition to the Power button and indicator lights, there is Menu/Exit, Keystone, Source, Color Mode, Enter, Blank and directional keys. The Zoom and Focus are controlled by two manual rings that are located at the front of the chassis surrounding the projection lens. 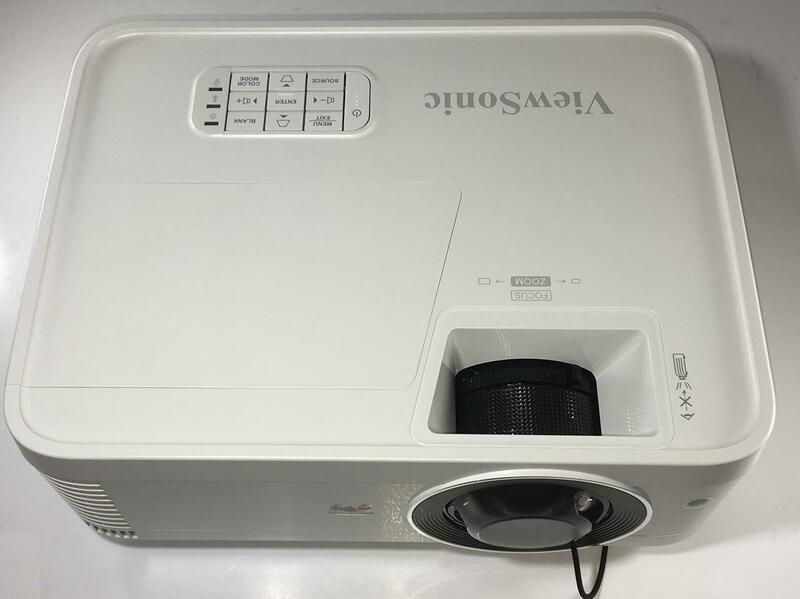 I know it is unusual to discuss a speaker in a projector, but these have become more common, as projectors have become increasingly portable. 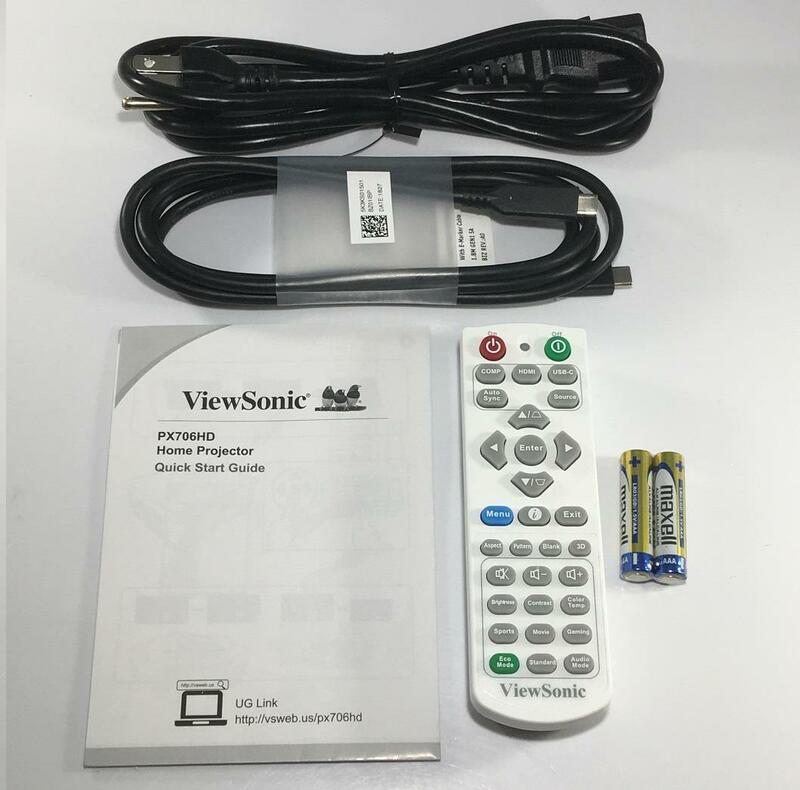 With the PX706HD, ViewSonic has embedded their SonicExpert Technology into the unit. This includes an extra large speaker chamber, single integrated 5W speaker with a audio range of 20Hz - 20Khz. While this has been the best sounding integrated speaker in a projector that I have tested, it will likely go unused by muting while playing games or movies unless you take the PX706HD on the go. If you do need it though, it is plenty loud enough with good audio quality to use in place of your preferred audio method. Of note, the PX706HD does have several Audio modes, including a “Gaming Mode” for audio. 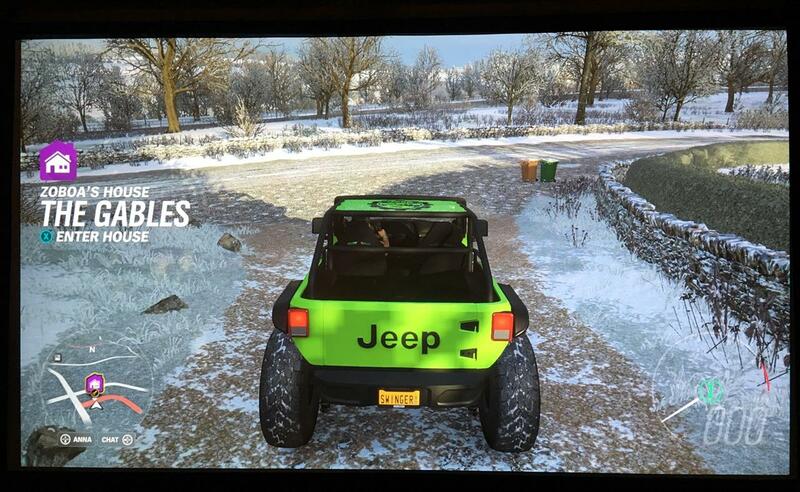 It is touted as having “Special tuning for playing games with more high frequency details.” While this mode did indeed change the audio dynamics of the internal speaker, if you intend to use the onboard audio, it is best to test the Standard, Game and Movie modes to determine which one best fits your listening experience. Regardless, there is enough sound that you can use it as needed to play if you do not have headphones or a home theater handy. 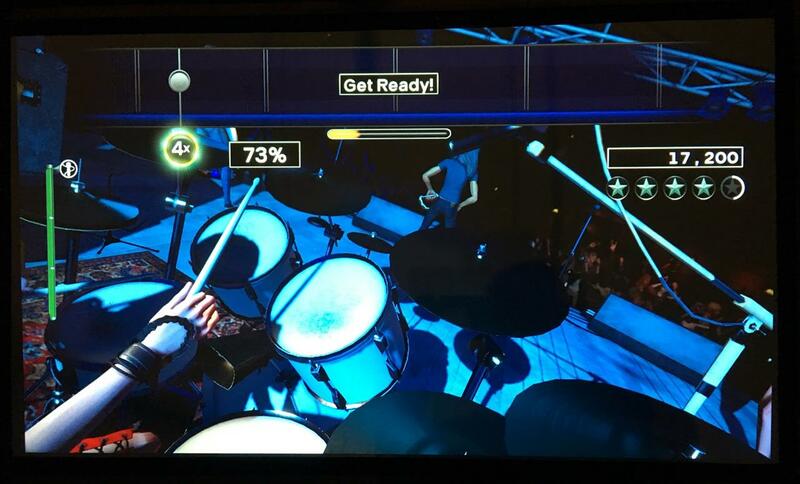 The very first game I tested the projector on was Rock Band 4. With my existing projector, there is a bit of a stutter with the words for the song as they scroll across the top of the screen that makes them a bit hard to read. Troubleshooting led me to either the projector or the receiver, neither of which were going anywhere. However, once I ran the game through the PX706HD, it was clear that my previous projector was the issue, as the song lyrics flowed across the screen silky smooth and easy to read. I would suspect that the 16ms latency has something to do with that, as I also so noted that the game graphics and drum/guitar streams were also smoother than I remembered. Either way, this makes me a very happy gamer to see how clean everything looks now. 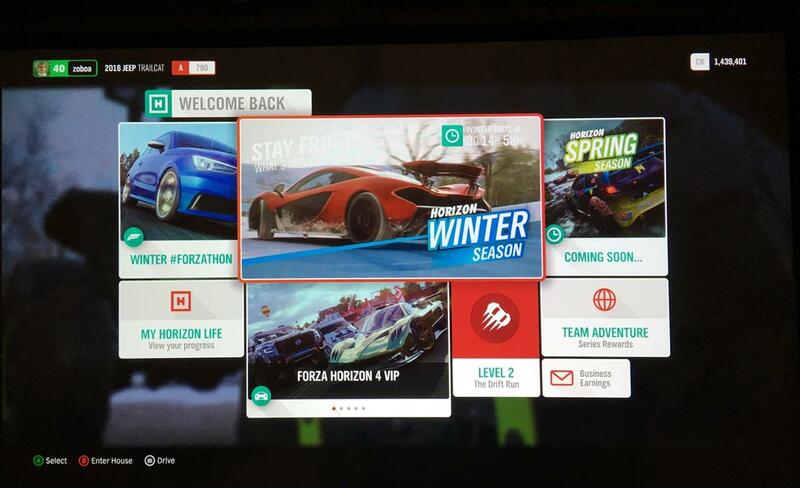 Another game I put some time into with the projector was with Forza Horizon 4. 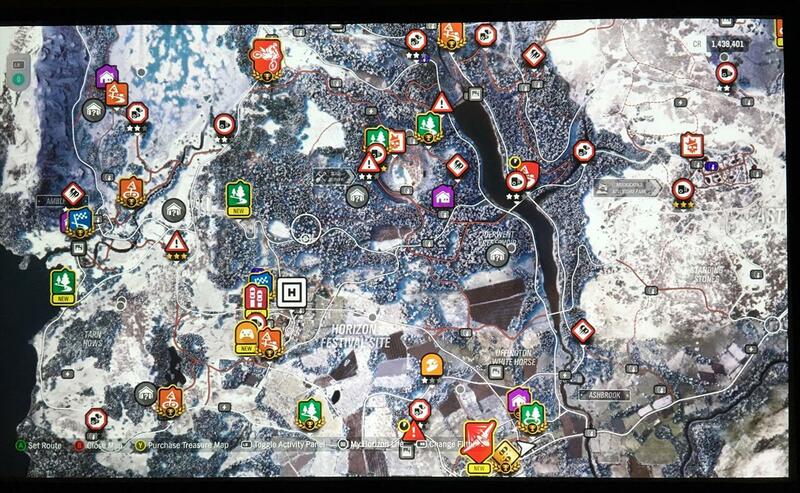 Graphically, this is one of the newest and nicest looking games i have on Xbox and it really showed while playing. Especially the cut scenes, which are much higher grade than the actual game play footage. 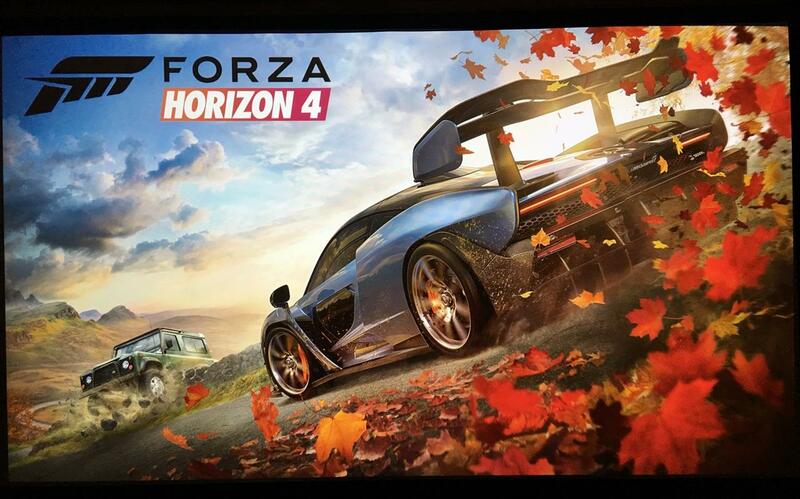 I originally shot an ~40 second video of the opening cut scene of Forza Horizon 4, as I think this is one of the best looking views of any recent game. 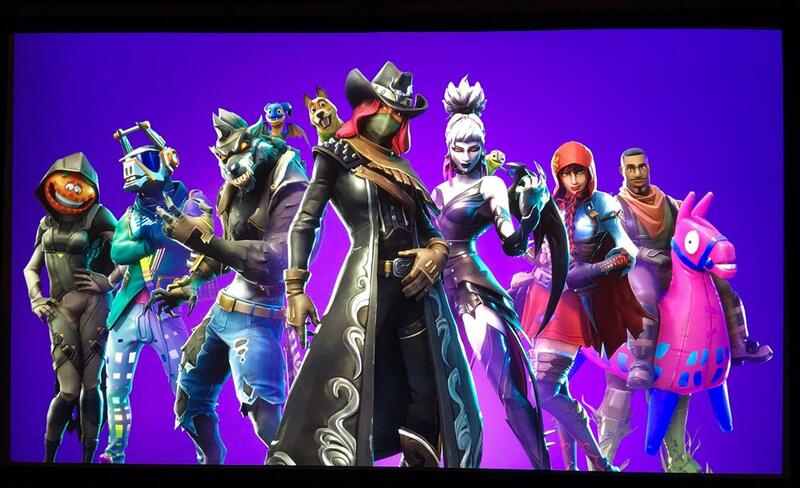 However, my iPhone and Apples crummy .mov format didn't do it justice, so take a look at this still image of the splash screen for the game. 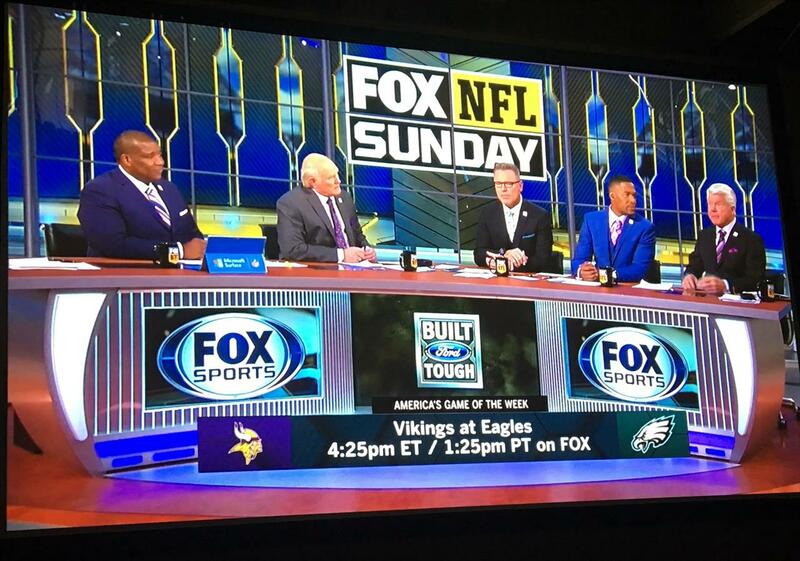 I spent a lot of time watching live sports on the PX706HD using both a direct feed from satellite as well as cable, and even the ESPN application found in the Xbox One. Nothing shows off a projectors capability than how it renders a live sporting event. Football was the primary view, both the NFL via the Sunday Ticket as well as some MLS games via the aforementioned ESPN app. 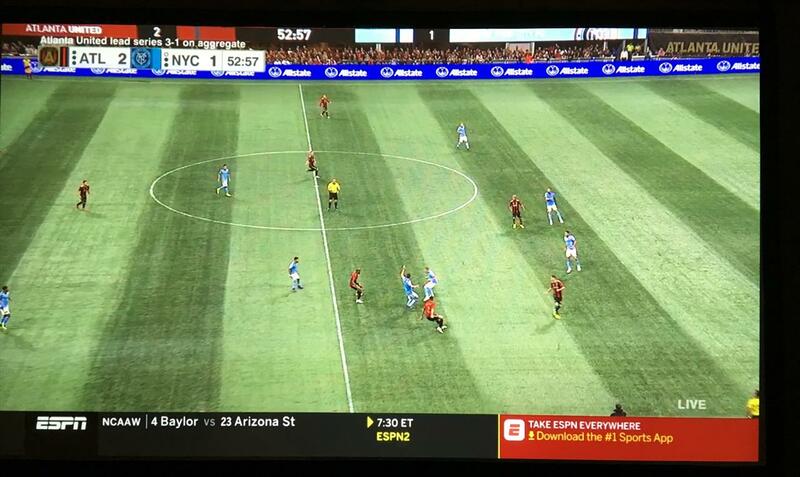 As you can see from the image below of this Atlanta United and NYC game, it does a nice job of keeping the action clean and easy to see. 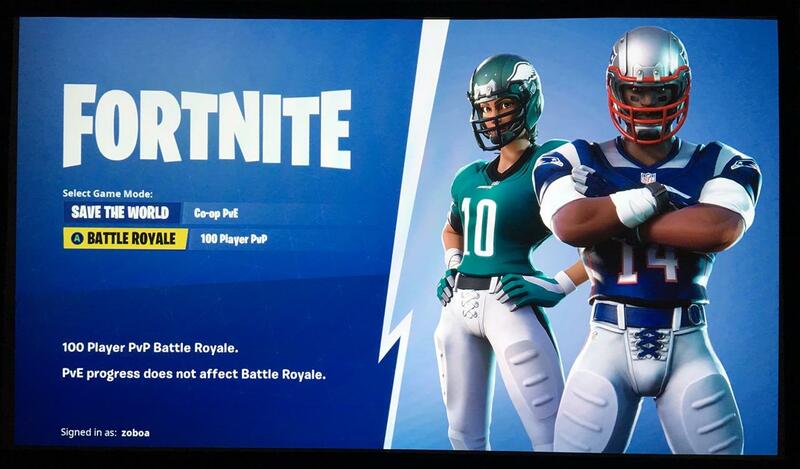 The NFL games especially show look bright and clear and there is zero screen tear, just smooth picture for the entire game. While the PX706HD does offer 3D, I was unable to test it as it does require active-shutter 3D glasses sold by ViewSonic and their retail partners. The recommended model is the PGD-350, which are available are for between $50 - $70 depending on the retail source. The 3D technology seems to have officially hit the “fad” stage, and is being phased out of many TVs going forward, so I was a bit surprised to still find it included in the PX706HD. Regardless, there are some excellent games that were produced in 3D (as well as plenty of movies) that would still benefit from watching in the format. Overall, I tested the ViewSonic PX706HD over many hours of gaming, TV, live sports and streaming movies and shows each. I never once saw anything that would question the quality or capabilities of the projector or the DLP technology driving it. 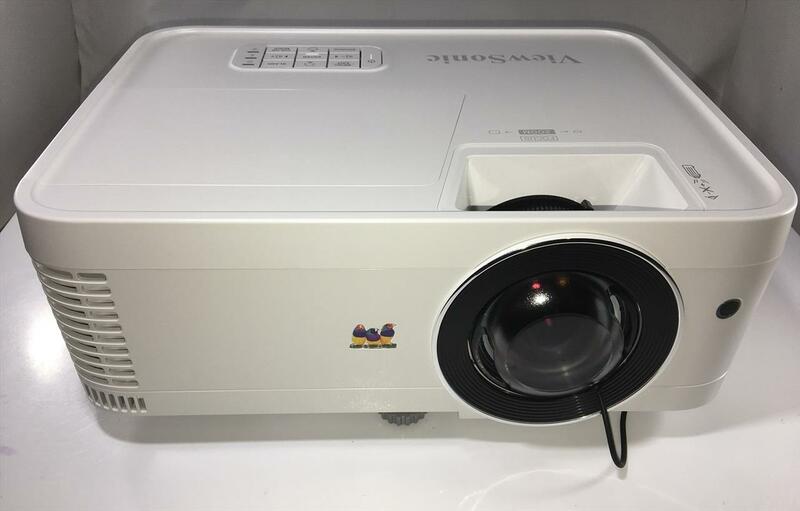 All the shows, including those with deep blacks looked great and were easy to watch and reinforced that this projector is the best one I have reviewed to date. This is a short throw projector, so distance to screen is dependent upon the size of image you are trying to display. The ViewSonic PX706HD was tested using an Xbox One, DirecTV and Spectrum Cable boxes and viewed on a 16:9 92” Da-Lite fixed screen. Images taken with an iPhone 6S+. 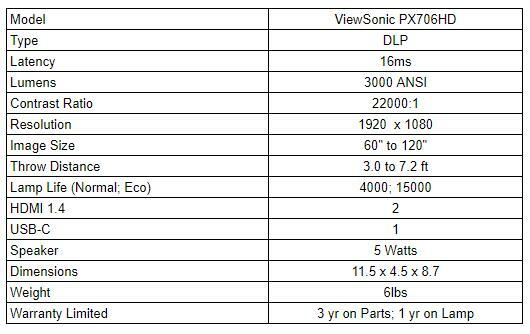 I am not sure I have ever handed out a perfect score before on a projector, but the ViewSonic PX706HD has certainly earned it. I wasn’t able to find any flaws in its performance for gaming, sports or just watching Netflix and TV. The colors were vivid, the image bright, crisp and clear and it was silky smooth. If you are a gamer not wanting to invest in 4K, but just simply looking for a projector to give you the best possible performance at the best price, then I cannot recommend the PX706HD enough. 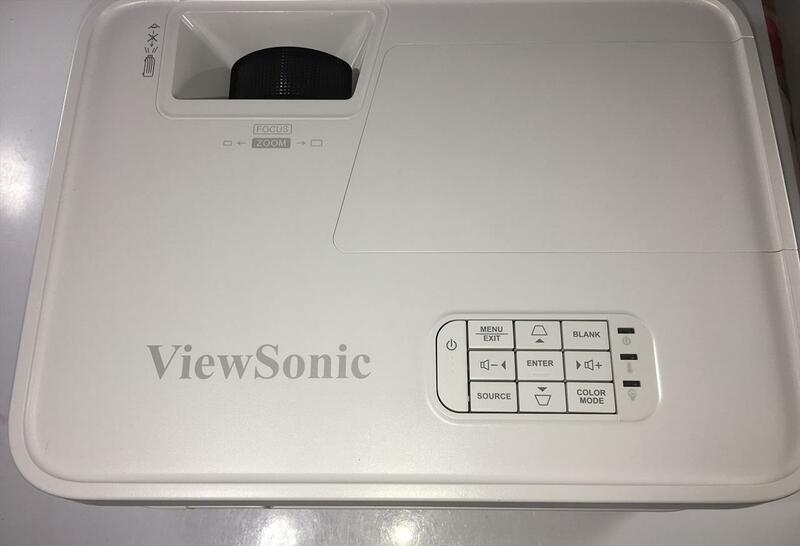 The ViewSonic PX706HD is the best gaming specific projector I have reviewed, and quite frankly, one of the best projectors I have ever reviewed period. 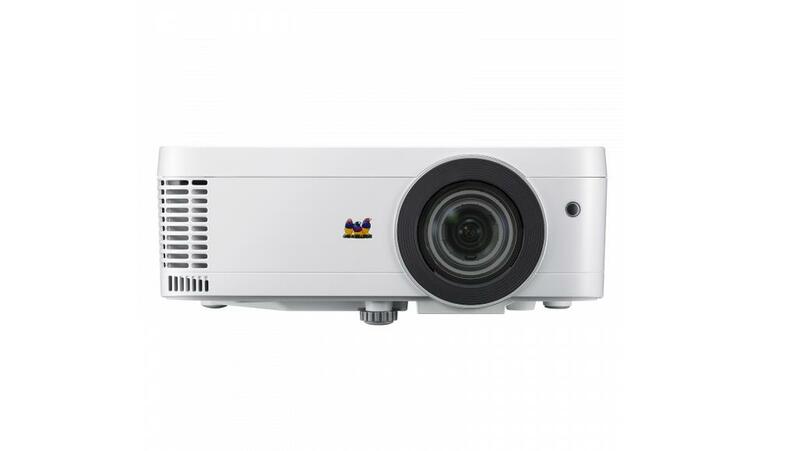 The image quality, ease of setup, brightness and compact size blow away most of the projectors in its class. When you factor in the price point (sub $700 at publication) and performance combined with the form factor, this is must buy for anyone looking to update their gaming or home theater projector but aren’t wanting to jump into 4K realm just yet.